MANCHESTER, NH -- Bernie Sanders apologized to Hillary Clinton and his own supporters Saturday night for a breach of her campaign's valuable voter data, seeking to put the controversy to rest in a debate that quickly moved on to national security concerns and Americans' heightened fear of terrorism. Clinton, the Democratic front-runner who kept an eye on the general election, was also sharply critical of Donald Trump's plan to ban Muslims from entering the United States, calling the leader of the GOP race the Islamic State's "best recruiter." Clinton and Sanders, her closest challenger, entered Saturday night's debate in the midst of one of their fiercest fights - about the campaign itself rather than a national or international issue. Clinton's campaign accused Sanders' team of stealing information used to target voters and anticipate what issues might motivate them. In response to the breach, the Democratic National Committee temporarily cut off Sanders' team's access to its own data, a move the Vermont senator said Saturday was an "egregious act." Clinton quickly accepted the apology Saturday night, saying "We should move on because I don't think the American people are interested in this." Clinton and Sanders were joined on stage by former Maryland Gov. Martin O'Malley, who has struggled to be a factor in the race. 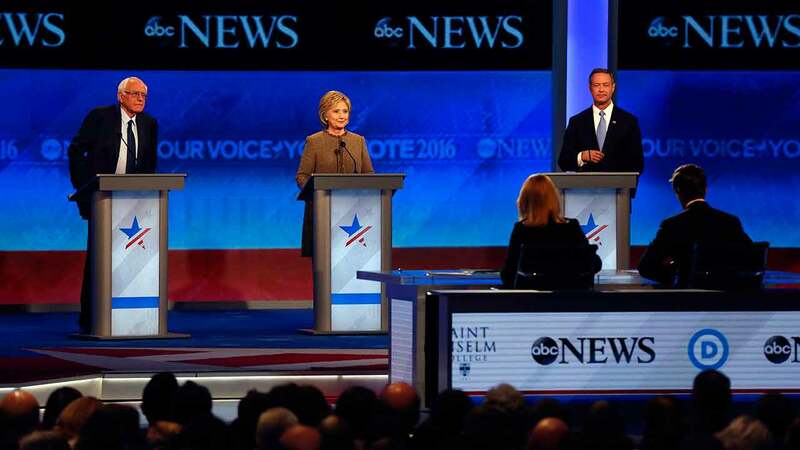 O'Malley was aggressive in seeking to play a role in the debate, repeatedly talking over moderators and accusing his rivals of having outdated views on foreign policy. "If the United States does not lead, there is not another leader - there is a vacuum," she said. "Yeah, regime change is easy, getting rid of dictators is easy, but you have to think about what happens the day after," he said. All three candidates stressed working more closely with Muslim-American communities to tackle radicalism at home - a sharp difference from the rhetoric of some Republican candidates. Returning to her focus on Trump, Clinton said, "If you're going to put together a coalition in the region to take on the threat of ISIS, you don't want to alienate the very countries you need to be part of the coalition." Sanders sought to stand out on foreign policy by noting that he voted against the 2003 invasion of Iraq, an unpopular war Clinton supported. He said he does not support any "unilateral military action" but rather a coalition in which the U.S. works hand in hand with Muslim nations to fight the radical militant group. Sanders has accused Clinton of being too cozy with Wall Street and running a campaign funded by wealthy executives, charges she has rejected. Asked whether corporate America would love a Sanders presidency, he said simply, "No, I think they won't." When Clinton was asked the same question by moderators, she quipped, "Everybody should."